This is a recipe from this month's Food Network magazine. I did not have a full pound of the sauerkraut and used what I did have which, I am guessing, is half the amount. I was intrigued with the inclusion of the sauerkraut and had to make it out of curiosity. Pierce the potatoes in a few places with a fork; microwave until slightly softened, about 4 minutes, then halve lengthwise. When cool enough to handle, put through a ricer. You can grate it but the ricer makes work of it, in only a minute or two. Add the drained sauerkraut to the grated potatoes along with the herbs, eggs, three-quarters of the scallions, 1 teaspoon salt, and pepper to taste. 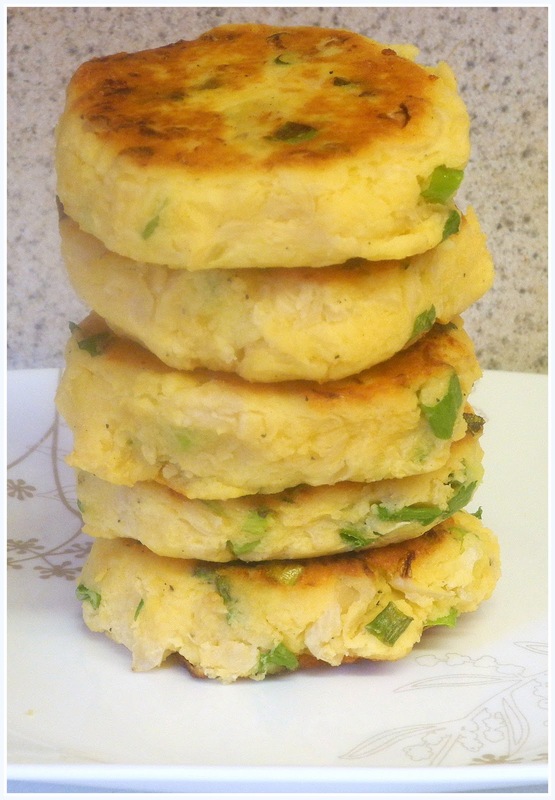 Stir in 1 tablespoon flour, then form into four 1/2-inch-thick patties. I'll have to make these for my sister who loves sauerkraut! This looks delicious! Lovely dipped in some spicy chilli sauce! Yum! I would love these! They look yummy!! Ooh sauerkraut that is quite the mystery ingredient. Love it and these potato cakes. I can imagine the are absolutely delicious! These look nice and fluffy.